Lectins are a diverse group of proteins and glycoproteins that exhibit specific binding for certain carbohydrates. Proteins with this property have been described in a wide variety of taxa, ranging from bacteria (e.g. Neter 1956) to slime molds (Barondes and Haywood 1979) and lower vertebrates (Simpson et al. 1978), but the best characterized examples are from plants. These proteins were originally characterized as cell agglutinins, until the term lectin was introduced by Boyd (1954, 1963) to encompass a larger range of activities involving selectivity for specific saccharides. 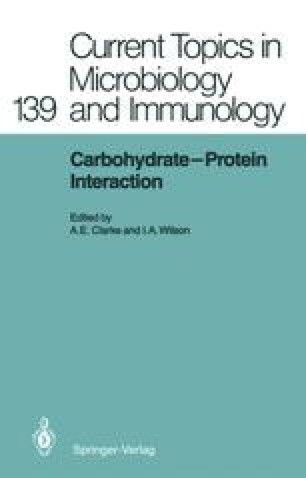 There is no universally accepted definition that specifies exactly the functional classes of proteins included in the lectins, but it is generally agreed that such well-known groups as antibodies, enzymes, and transport proteins are not included. These groups are covered separately in later chapters of this book.